“Take your pup to the location of your wedding weeks in advance, so that she becomes well acquainted with the area. Allow her to practice walking down the aisle and reward her with a treat afterward. 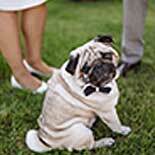 This will provide your puppy with an incentive to repeat her performance with ease on your big day,” notes Heidi. Have dog food and a bowl of fresh water handy at the reception to ensure that Fido is well fed. Make sure your pet doesn't sample any of the human food, as even a small helping off the wedding menu could make him or her sick. Finally, make sure to check with your venue to ensure you pet is welcome. Many venues do not allow any dogs other than service animals. Outdoor wedding venues are more likely to accommodate pet inclusion requests, but you still should talk with the management to make sure your little guy or gal is welcome.